I’ve been spending lots of time outdoors the last couple of weeks, working in my vegetable garden and hiking looking for spring edible wild plants. 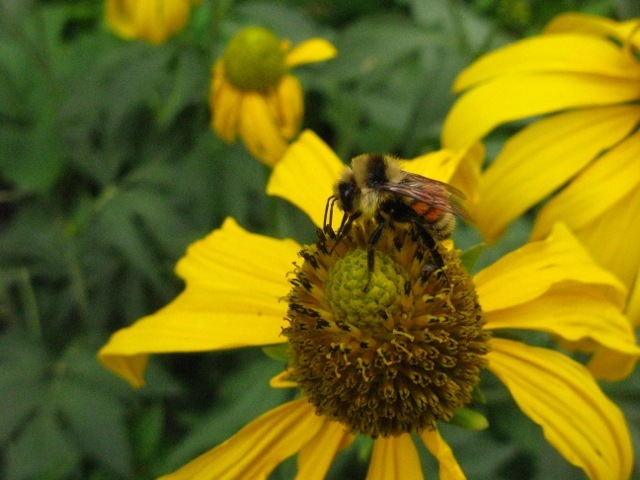 Because of the all the attention on bees lately, I’ve been particularly aware of them and their role as the silent partners in my gardening and plant health in general. Until recently when I considered bees, I thought of honey bees. They are actually an import from Europe and are the variety most associated with colony collapse disorder. (watch a video on this here) Nobody is 100 percent sure of all the reasons for colony collapse disorder, but experts are fairly sure that part of the cause is related to agriculture chemicals. In fact, a speaker recently said that cities are currently the safest place for bees – agricultural lands are much too toxic! The grumpy and dangerous Africanize bees are a strain of honey bees. The site goes on to say: “ Sonoran Desert bees range in size from the world’s smallest bee, Perdita minima, which is less than .08 inches (2 mm) to carpenter bees (the genus Xylocopa), gentle giants that may have body lengths of almost 1½ inches (40 mm) and weigh over a gram. Our native bees burrow into the ground or create nests inside hollow, pithy, dried stems or abandoned tunnels left by wood-boring beetles. 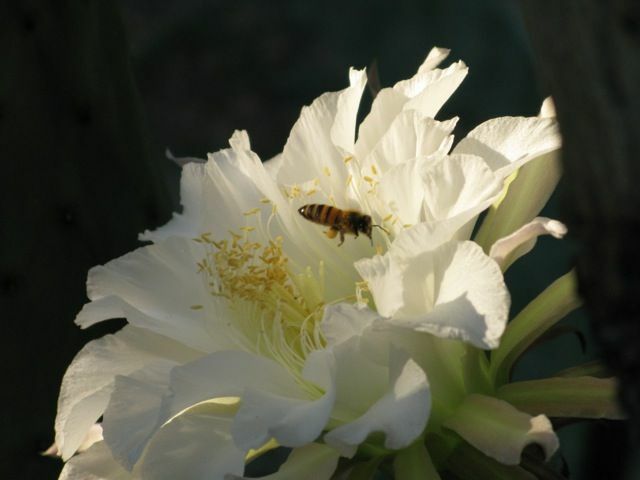 All bees are herbivorous except for parasitic forms that prey on other bees.” You can read more about what the Desert Museum has to say about bees here . If you are a gardener, you know that your squash and pumpkin flowers need to be pollinated if you are going to have vegetables. 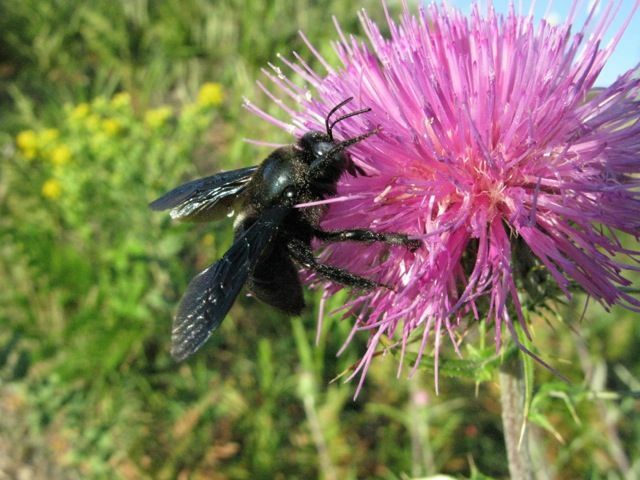 Carpenter bees like the one above nest in dead trees and pollinate squash, eggplant, cotton, tomoatoes, mesquite, prickly pears and other local flowers. If there aren’t bees around to help pollinate your garden, you have to get out there with a Q-tip and do it yourself. You can avoid this chore by attracting more bees to your garden with a bee box. Tucson Botanical Gardens has directions on how to build one here. I was experimenting with a Zuni traditional garden this year, with recessed garden beds contains by raised walls made from dirt, and have had a great experience with the bees. It looks like quite a few of the native burrowing bees really like the small dirt walls for their burrows! I’ve seen a few different types of bees making small burrows in the walls so far. A great benefit of this garden that was completely unexpected. Very interesting that the bees are going into the sides of the garden. Probably because it is so soft and easy to dig. Live-in pollinators, how wonderful. As for the elderberries, just be careful about eating the raw berries. What a feast of information about bees. I’ve been getting worried about them and feel a little better now. A little.